NASA has navigated the solar system with spacecraft and landers, but still, our celestial neighbors remain vast frontiers, particularly in the search for life. Now, an alliance of researchers including scientists at Scripps Institution of Oceanography at the University of California San Diego will accelerate the quest to find it. The NASA Astrobiology Program has announced the establishment of the Network for Life Detection, N-FoLD, which connects researchers to pursue the detection of life and clues thereof on our neighboring planets and their moons. N-FoLD includes an oceanic research alliance led by the Georgia Institute of Technology. The alliance is called Oceans Across Space and Time (OAST) and has received a $7 million NASA Astrobiology grant with the long-range goal of extracting secrets from present and past oceans on Mars, Jupiter’s icy moon Europa, and Saturn’s moon Enceladus. But OAST will also ramp up the study of the conditions that spawned first life in Earth’s oceans. N-FoLD is one of five new Research Coordination Networks (RCNs) announced by NASA’s Astrobiology Program. The other RCNs pull together research communities that include the study of early Earth and its chemistry, evolution, distant habitable worlds, and exoplanet systems. Oceans Across Space and Time could one day help NASA put a submarine on a rocket to Europa to look for life in the ocean beneath its ice crust. Or OAST could join N-foLD colleagues to help NASA explore parched Martian landscapes that once were oceans. But the path to our space neighbors leads through studying Earth with those “science questions and supporting activities.” Field and lab experiments on our planet will divulge more knowledge about chemical and biological evolutionary strategies so that researches can develop instruments and methodology that reliably detect signs of life on other planets and moons. One of N-FoLD’s goals is to participate in future astrobiology space missions from the start so that they can successfully identify target spots on other planets or moons where signs of life could actually be detected if present. "A major challenge for life detection is where on a given planet or moon to look for life,” said Scripps biological oceanographer Jeff Bowman, a deputy principal investigator of OAST. "The density of life on our own planet extends across several orders of magnitude. Look for life in the wrong place and Earth could appear lifeless." OAST’s team has the expertise to bridge earthly data with celestial goals. 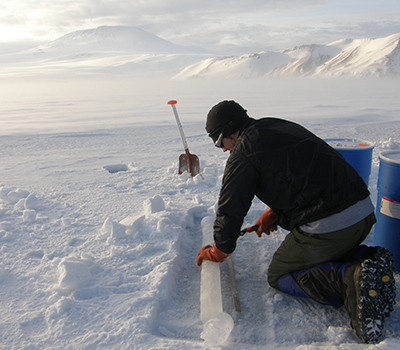 Many of its 18 co-investigators and their teams have already explored biogeochemistry in our own planet’s eons-old rock record, in the atmosphere, the oceans, and the icecaps with an eye to extrapolating the data to other worlds. Other OAST researchers have helped design Mars probes, or build robotic submarines intended to one day scour Europa’s subsurface ocean for even a hint of life. OAST includes Scripps Institution of Oceanography researchers Doug Bartlett and Greg Rouse, and investigators from the University of Kansas, Louisiana State University, the Massachusetts Institute of Technology, Stanford University, the Blue Marble Space Institute of Science, the University of Texas, Colgate University, the University of Central Florida, the University of Auckland, York University, the University of Otago. and the New Zealand National Institute of Water and Atmospheric Research. About Scripps OceanographyScripps Institution of Oceanography at the University of California San Diego, is one of the oldest, largest, and most important centers for global science research and education in the world. Now in its second century of discovery, the scientific scope of the institution has grown to include biological, physical, chemical, geological, geophysical, and atmospheric studies of the earth as a system. Hundreds of research programs covering a wide range of scientific areas are under way today on every continent and in every ocean. The institution has a staff of more than 1,400 and annual expenditures of approximately $195 million from federal, state, and private sources. Scripps operates oceanographic research vessels recognized worldwide for their outstanding capabilities. Equipped with innovative instruments for ocean exploration, these ships constitute mobile laboratories and observatories that serve students and researchers from institutions throughout the world. Birch Aquarium at Scripps serves as the interpretive center of the institution and showcases Scripps research and a diverse array of marine life through exhibits and programming for more than 430,000 visitors each year. Learn more at scripps.ucsd.edu and follow us at Facebook, Twitter, and Instagram.About UC San DiegoAt the University of California San Diego, we constantly push boundaries and challenge expectations. Established in 1960, UC San Diego has been shaped by exceptional scholars who aren’t afraid to take risks and redefine conventional wisdom. Today, as one of the top 15 research universities in the world, we are driving innovation and change to advance society, propel economic growth, and make our world a better place. Learn more at www.ucsd.edu. admin. NASA Pushes Exploration of Oceans in Solar System. 2018-11-02.